할로윈이 돌아왔다. 할로윈 즈음이면 외출하기 무섭다는 사람이 많다. ‘살인 광대(scary clown)’ 같은 게 지천에 널려있기 때문이다. 하지만 할로윈이라고 해서 꼭 무섭기만 해야 할까. 어린이나 노인에게도 재밌는 경험이 될 수도 있지 않을까. 요즘 많은 사람은 할로윈이 미국에서 비롯한 전통이라고 생각한다. 유럽이 미국에서 가져왔다는 얘기인데, 사실은 아니다. 할로윈의 기원을 찾으려면 수백 년을 거슬러 올라가야 한다. 유럽에 살던 켈트족은 고유한 새해 맞이 전통이 있었다. 10월31일 삼하인(Samhain) 축제라는 새해 맞이 행사를 열었다. 이날 켈트족은 다가오는 새해를 축하하기보다 죽은자를 기리고 한해 수확을 기념했다. 이런 파티에서 참석한 사람은 실제 세계를 상징하는 옷으로 치장했다. 잠시 멈춰 쉬며 들판을 불태워 옛것을 치우고 새 것을 채워넣을 공간을 마련했다. 그러니 이들이 단순히 옷만 차려 입고 불만 피운 것은 아니다. 켈트족은 이날 사후 세계와 산 자의 세계가 가장 가까워진다고 믿었다.켈트족은 유령을 내쫓으려고 근대(beets)로 등불을 만들었다. 호박을 쓰는 건 미국식이다. 등불을 만들 만한 근대가 미국에 없었기 때문이다. 하지만 몇몇 사람은 진정한 할로윈이 가톨릭 교회에서 나왔다고 말한다. 가톨릭 교회가 만성일(Allehelgen∙All Saint’s Day) 전야를 기리던 데서 나왔다는 설명이다. 만성일은 이름 그대로 모든 성인을 기리는 날이다. 여기서 할로윈이라는 이름이 나왔다고 한다. 가톨릭 교회가 만성일을 10월31일로 옮기기로 결정했다. 다른 곳에서 유래한 두 가지 전통을 한 개로 합치고 싶었기 때문이다. 오늘날 덴마크는 두 가지 모두를 기린다. 물론 당신이 가톨릭 신자일 경우에만. 날짜 말고도 두 가지 전통은 공통점이 있다. 1년에 하루 죽은자가 돌아올 수 있다는 믿음이다. A dead person in a cage trying to get out. He is sitting on a pumpkin. Do you wanna take him home? 할로윈이 특별하게 취급받는 까닭은 무엇일까. 많은 사람이 세계 전역에서 나타나 사람을 놀래키는 살인 광대를 두려워한다. 덴마크도 마찬가지다. 하지만 우리는 할로윈의 밝은 면도 기억해야 한다. 너무 무서워서 저녁에 집 밖에 나설 수 없을 때는 더더욱 기억하기 힘들겠지만 말이다. 덴마크에는 티볼리(Tivoli))라는 놀이공원이 있다. 한국에 롯데월드 같은 곳이다. 할로윈의 즐거움을 되살리고 싶다면 바로 티볼리에 가야 한다. 굳이 놀이기구를 타지 않아도 좋다. 하지만 티볼리에는 분명 할로윈 분위기를 돋워줄 매력이 있다. 티볼리는 할로윈이나 성탄절 같은 명절에 많은 돈을 들여 치장한다. 올해는 2만 가지 호박과 5천 가지 식물을 마련했다. 할로윈 장식에만 18일이 걸렸다. 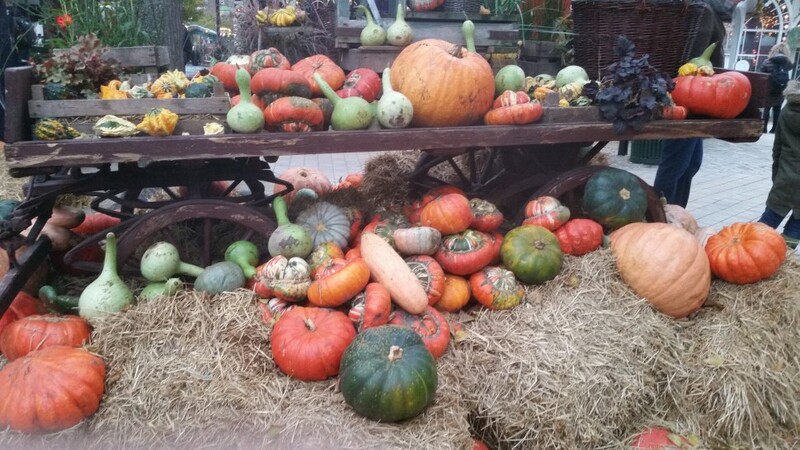 Some of the pumpkins being used as decoration in tivoli. All sorts of shapes, sizes and colors. 여러분은 어떨지 모르겠지만 나는 나이 들어서도 여전히 티볼리에 간다. 내 안에 동심은 무척 중요하다. 하루에 네 번 큰 무대에서 아이들을 위한 공연이 열린다. 아이들이 좋아하는 캐릭터 라스무스 클럼프(Rasmus Klump)가 주인공이다. 무대 주변에는 할로윈 장식품과 다양한 먹거리를 파는 작은 가게가 즐비하다. 덴마크 전통 식품 애블스키브(skive)에서 유래한 작은 사과 슬라이스도 판다. 애블스키브보다 나은 것이라면 그뢰그(gløg)을 꼽겠다. 따뜻한 레드 와인에 건포도와 아몬드 등을 넣은 술이다. 보통 덴마크에선 성탄절에 먹지만 추운 날씨에는 조금 일찍부터 그뢰그를 마시기도 한다. 아이를 키우거나 게임을 즐긴다면 티볼리가 개발한 스마트폰 게임을 해보자. 공원을 돌아다니는 동안 나타나는 좀비를 모두 쏴 죽여 공원을 지키는 게임이다. 화려한 장식과 모바일 게임, 놀이, 탈 것 외에도 티볼리에서 놓치지 말아야 한 것이 하나 남았다. 밤이 길어지고 낮이 짧아지면서 겨울 저녁 하늘은 금방 칠흑 같이 어두워진다. 이 시간이 되면 티볼리 구석에 있는 큰 호수에 가보자. 물고기한테 먹이를 주거나 호수에서 펼쳐지는 조명쇼를 관람할 수 있다. 음악과 빛, 불이 호수 한가운데서 어울리는 장관이 펼쳐진다. 만일 여러분이 운이 좋다면 이 때 딱 맞춰 비까지 내려줄 것이다. 금상첨화다. 자연이 여러분에게 건네는 선물이랄까. 그러니 당장 집에서 나와 티볼리 공원에 가자. 할로윈에 티볼리에 가지 않는다면 후회할 거다. A scarecrow watching over a lot of decorations so dont go to near. It’s that time a year again where it’s time to celebrate Halloween. These days there’s a lot of people there are too scared to go out because of the hole “scary-clown” thing that’s going on. But does Halloween have to be so scary or can it also be a fun experience for young and old people? 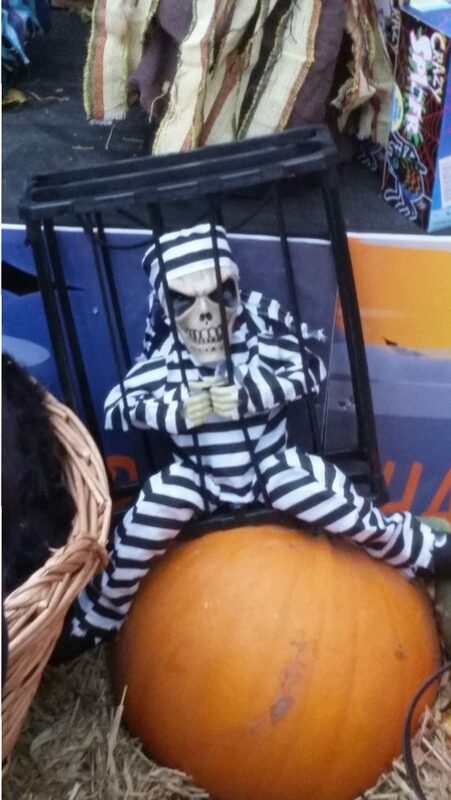 Now many people might think that Halloween is some American tradition that Europe adopted but no. To find the original beginning off Halloween we have to go servile hundreds of years back. There used to be a folk called Kelterne here in Europe whom had their kind of new year that’s called Samhain(on October 31st). Instead of celebrating the new year coming they honored the dead and celebrated the harvest. Now at these parties, people would dress up as a symbol of the normal world order to be stopped for a while and also burn the fields to get rid of the old making space for the new. So it’s not only the dressing up and fire they had. They believed that it was the day where the world between the death and living was the shortest. So in order to keep the ghosts away they would make lamps out of beets. The pumpkin is American because they didn´t have the right kind of beets. However some people will say that the true original beginning of Halloween is coming from the catholic church. The night that they celebrate All Saint´s Eve (Danish Allehelgen) which of course is a celebrate of all the saints. It’s also from here that the name Halloween came from. The church decided to move the day to the 31st October. So that way the two traditions that came from different places become one. Now in Denmark we celebrate both things (if you have a religion). Beside the date the only thing the two traditions have in common is that they believe the dead people can come back on that one day a year. So what’s so special about this Halloween. Well a lot of people fear these scary clowns there is going around in the world and of course scaring people. Denmark is not free from that either. But we have to remember the good things about Halloween. Sometimes it can be hard to remember when you are too scared to leave your house especially in the evening. In Denmark we have Tivoli which is kind of Koreas Lotte World. 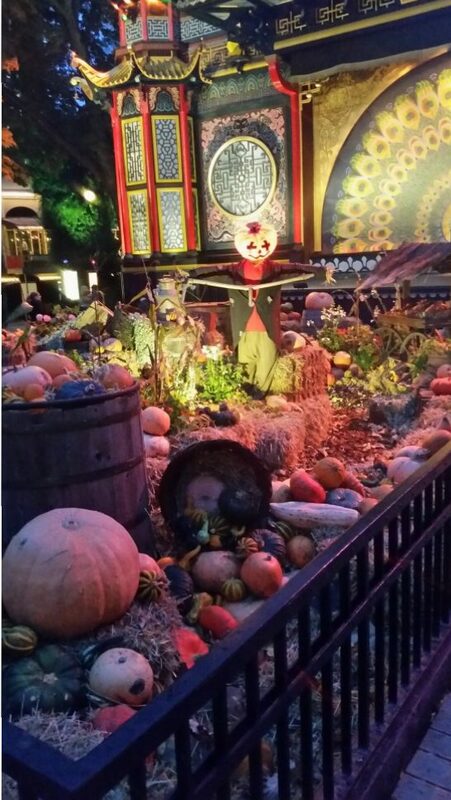 And if there is any place you can go to remember the fun about Halloween its Tivoli. You don’t have to go on the rides if that’s not your thing. But there’s is one thing Tivoli can give you and that’s the mood back. Tivoli spends a lot of money on decoration for holidays like Halloween and Christmas. This year they have 20.000 different kinds of pumpkins, 5.000 plants and much more and they did the hole decoration in 18 days. I don’t know about you but I don’t go there to just be a grown up. I still have my inner child which is very important. There’s performances 4 times a day on the big stage for the children with a famous character – Rasmus Klump. 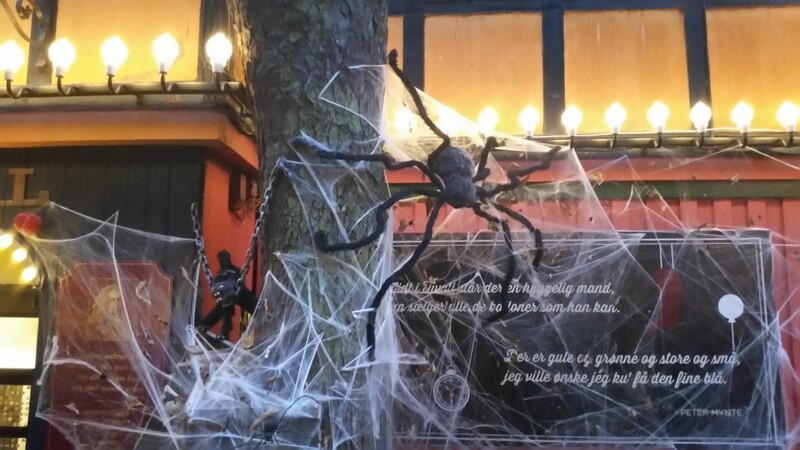 Around the stage there’s a lot of small shops where you by Halloween decoration, different kinds of food and mini apple slices which is coming from the original Danish æbleskive. And what else goes better to æbleskiver than gløg (warm red wine with raisons, amounts and something else). Usually we get this for Christmas but with the weather so cold these days we are starting a bit early on some things. >If you have children or just like to play games then Tivoli developed a game for Smartphone’s. This means while you go through the park you have to shoot all the zombies you can find to keep them out of the park. Besides all of the great decorations, games, plays and rides there’s one last thing that’s worth going to Tivoli for. As the nights gets long and the days gets short the evening gets dark pretty fast. This means it’s time to go down to the big lake there is in the corner. You can feed the fish or watch the light show there’s in the lake. You will experience music, lights and fire in the middle of the water and if you are lucky it will be raining at the same time which is something that makes it even more beautiful. A gift from nature. So get out of your house and head to Tivoli. You will not regret it.